All Products > "25264275 Multiplex Kit+ Parkmaster Pro"
Anyone with a hankering for extreme 3D aerobatics is going to want one of these, no question. For the would-be 3D pilot it�s the perfect outdoor practice tool, being light, responsive, yet massively forgiving, whilst those with a bit of experience will instantly fall in love. Sure enough whether you�re flying in very confined spaces or even moderate wind you�ll confidently be able to fly the full 3D and pattern aerobatic repertoire, from tumbles and torque rolls to square loops and rolling circles. Adopting square-section carbon fibre spars the ParkMaster Pro boasts an unbeatably rigid fuselage, wing and tailplane along with a similarly tough carbon reinforced undercarriage and motor mount support. Speaking of which, there�s a redesigned motor mount too which facilitates the use of even more powerful motors and is a real eye-catcher when combined with the optional carbon motor bulkhead. 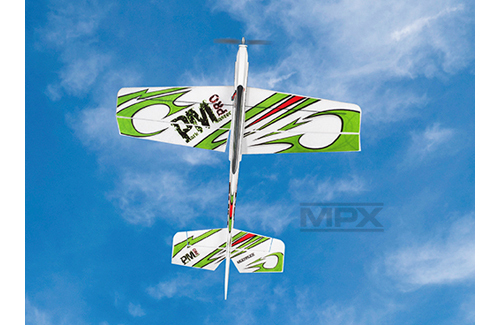 Designed, manufactured and packaged in typically diligent Multiplex style this is a model you�ll thoroughly enjoy assembling, delight in decorating (a plotted decal sheet is included) and be thrilled to fly.